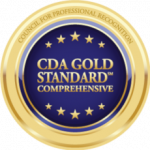 CCEI’s Preschool CDA Certificate Renewal program of study is designed to provide the 45 clock hours of professional development required by The Council for Professional Recognition in order to renew the National CDA Credential with a Preschool age setting. Must possess a high school diploma or GED obtained from institutions accredited and recognized by U. S. Department of Education and submit documentation as proof. Diplomas earned outside the U. S. or presented in a language other than English must be translated to English by a member of the American Translators Association, an approved credential evaluation agency approved by the Bureau of Educators Certification, or an accredited college/university. Textbook Information: No textbook is required to complete this CDA renewal certificate program. Prospective students are strongly encouraged to check with their licensing representatives to determine each program’s applicability toward state requirements.